Trigger Warning: Parts of this article are scary and detail specific accounts of torture including the video. Despite video surveillance, and both student as well as staff testimony, the school remains open and able to use a device they created and then later “modified” called the GED on students for any behavior they deem “problematic.” These contingent shocks are said by JRC staff to be “no more painful than a bee sting” but when investigative reporter Jennifer Gonnerman reported in Mother Jones Magazine, “when I tried the shock, it felt like a horde of wasps attacking me all at once. Two seconds never felt so long.” Some of these “behaviors” were: tensing their body or fingers; closing their eyelids for more than 10 seconds; uncontrollable tics (that were not self-injurious or harmful to others); reaching for a staff member’s hand; for covering their ears when things get loud; making more than five verbal sounds per hour (which includes clearing their throat, crying, laughing, using an inappropriate tone and asking to use the bathroom); wrapping one’s foot around the base of their own chair while seated; rocking; and wiggling one’s fingers. Even after the horrific video was released to the press of Andre McCollins being shocked for not taking off his coat has the Massachusetts Senator been successful in getting the Judge Rotenberg Center to stop using the devices. It is very unfortunate to hear that Andre isn’t the only one that has suffered and continues to suffer. 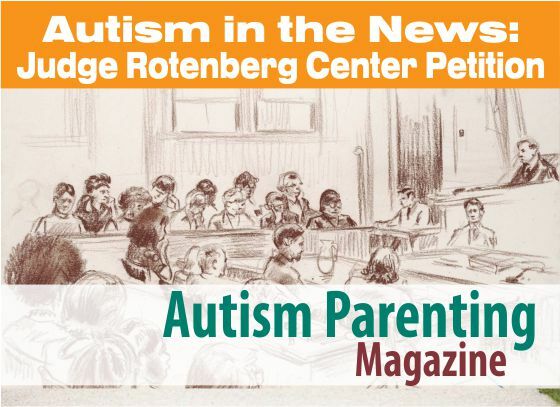 In an anonymous letter sent to Nancy Weiss, the former President of TASH, (and published here on Lydia Brown’s blog), the anonymous student had been humiliated and writes that JRC provoked his behaviors over a two month period by forcing him to wear diapers despite being independent in toileting and hygiene for years prior to attending JRC; and “sit in isolation with a straight upright posture, in the center of a hard restraint board, day after day, week after week, for two months;” by not letting him shower and continued his humiliation by strapping him to a “restraint board, naked, with my private areas exposed to the staff in the bathroom and the cameras was the most horrible, vulnerable, frightening experience for me.” After being treated this way, the anonymous student’s behaviors were documented and taken by a JRC official to court to get permission to use a GED device on him. The student goes on to tell how he lived every day in fear and is now doing well in a new program that respects his feelings without being “drugged up like JRC claims [he] would be if he left.” Before asking TASH to investigate he writes, “I have gotten so much better from getting real help instead of constant punishment and pain.” However the nightmares remain with them even after leaving the center. JRC’s counter argument seems to remain the same over the years standing by their belief that they are doing good by getting the majority of their students off psychotropic drugs. Yet when viewing their website, no mention of GED devices or electric shocks are mentioned. One might wonder though, if contingent shocks are such a great method to improve behaviors then why don’t they let parent’s know about the GED devices before applying to the school by stating the information on their website? Especially when the U.N.’s experts have publicly said that what JRC is doing is torture. Using electric current as a form of punishment isn’t allowed by law on terrorists or murderers but is allowed on children and teens at the Judge Rotenberg Center. Hopefully, with enough signatures the electric shock devices will be banned and more parents will be more cautious in sending their children to schools where students don’t have access to phone their parents on a daily basis without “paying” for phone calls. i cannot believe this is still happeneing, why isn’t something being done. Please protest, demonstrate, and scream your heads off. Share this if you want the torture to stop. Those vulnerable kids need us to save them from this torture. They’re allowed to do it because they have an excuse that it’s helping getting kids to stop self harm, but it’s done for nonsense, for things that have nothing to do with self harm, so it’s an excuse and not a reason. They can get away with it because the parents agree, but kids arent their parents’ property, and they have no right to do this. This is evil, and those who do nothing to stop it are part of the problem. Let’s be a part of the solution. Don’t let this subject die down. We have the power to change things, to put pressure on the government, and they’ll give in. if we just make noise loud enough and long enough. It has been decades and still the torture of handicapped children continues unabated, with millions paid to them by the government. No one is arrested, and no one rescues these helpless kids. The youngest is 3 years old. These kids are starved, shackled, abandoned, taunted, and jolted with illegally modified devices that cause 2nd and 3d degree burns. A half dozen children have died there. It isn’t a school -it’s a concentration camp. Do you know what JRC characterizes as behavior needing shocks? It is a disabled little girl with cerebral palsy who is blind and nonverbal moaning and reaching out to Staff for a hug. Yes, needing comfort and being unable to talk clearly indicates non compliant behavior to those sadists. The child got shocks for it. How sick!